When Pakistan’s civilian politicians united, last August, to force General-turned-President Pervez Musharraf from power, the moment was hailed as a democratic milestone in country long ruled by military men. 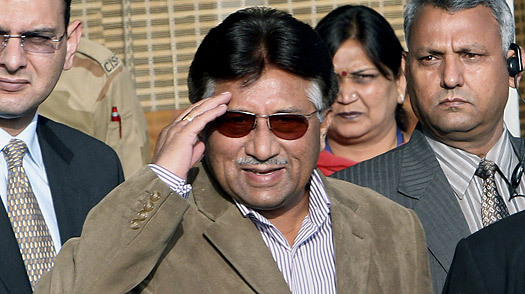 But now, as the country’s two main political parties remain locked in an endless power struggle while Pakistan’s security and economic crises spiral dangerously out of control, Musharraf has stepped back into the public eye. After months seeking solace on the tennis court and the golf course, the former strongman has in recent weeks given a flurry of speeches and press conferences. He is also planning a new memoir. And lest anyone mistake this renewed publicity campaign as nothing more than burnishing his legacy, Musharraf last week raised the prospect of a political comeback. Loyalists insist that he still has more to offer Pakistan than do his squabbling successors, and that he should be restored to power. But for critics and even many former supporters, Musharraf’s legacy remains so controversial that it has closed off the possibility of another military coup any time soon. Musharraf’s grim assessment of the performance of his successors is certainly shared by most Pakistanis: Recent polls show that the Zardari government’s approval ratings have fallen to levels comparable to the lowest recorded by Musharraf while in power. The government is under fire not only for the faltering economy, but also for failure to protect Sri Lanka’s visiting cricketers from a terror attack in Lahore last week , and for bowing to Taliban demands for the imposition of Islamic law in the Swat Valley. And the political turmoil is set to deepen, next week, when a protest march of lawyers and opposition politicians demanding the reinstatement of judges heads for Islamabad.